We drove 8 hours through the night to get to Disney World. And by "we", I actually mean my parents (primarily my father) because I drove a total of zero hours. Indeed, while they were fueling themselves on caffeinated beverages to make it to Orlando, I was sleeping soundly in the backseat. Thank you, Mom and Dad! 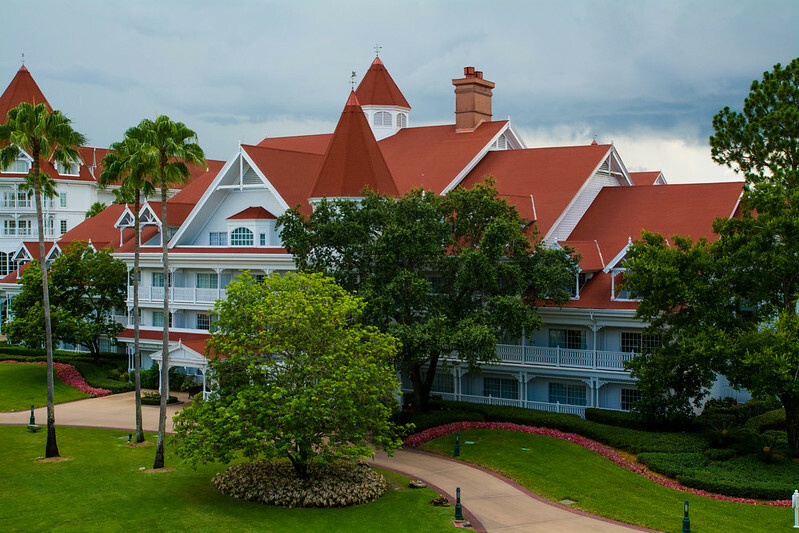 The last time we drove through the night to the Grand Floridian, we arrived to a vacant porte cochere where we sat confused until Dad went inside and got us a bellhop. This time, at 7:30 AM, we weren't alone. In fact, there were so many people there that the self-parking lot was reportedly full. Dad tried it anyway (and was lucky enough to find one empty spot) while I checked us in. 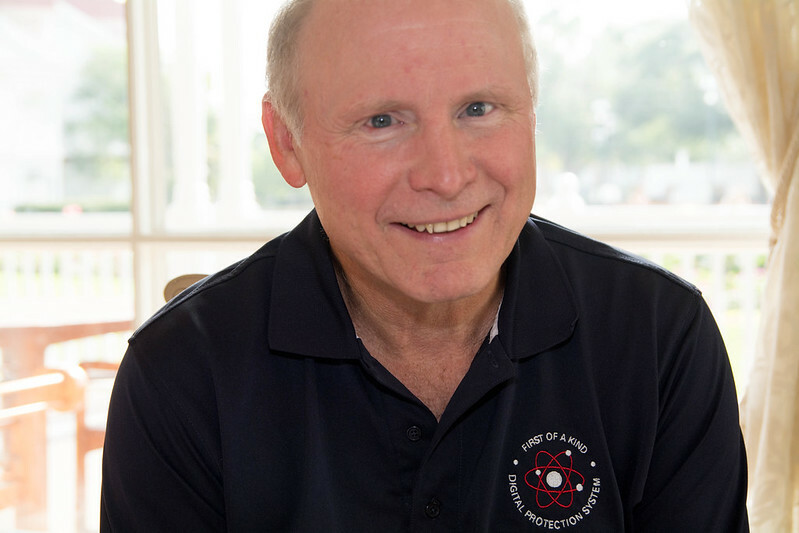 I was especially relieved to hear that our room was ready since I, a veteran of through-the-night driving, made a newbie mistake of not packing a change of clothes with my getting-ready bag. We were located in Boca Chica on the fourth floor in a dormer room. 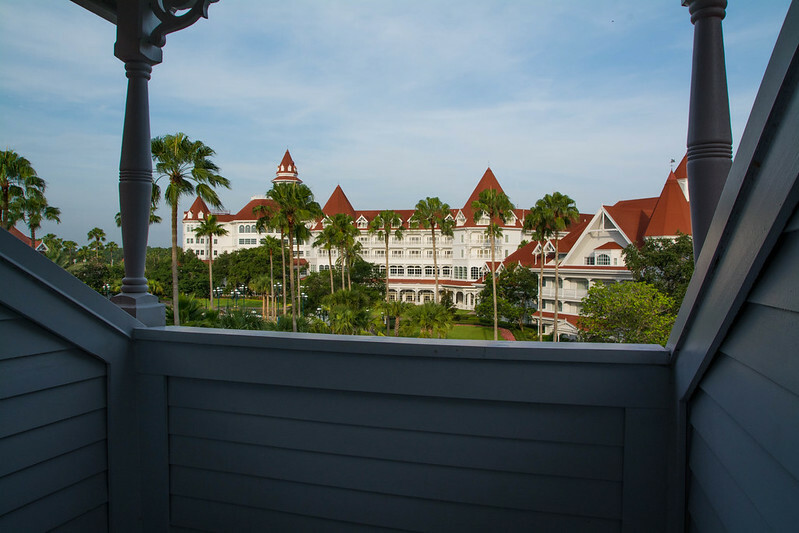 For more photos, check out my review of our Grand Floridian Garden View Dormer Room. 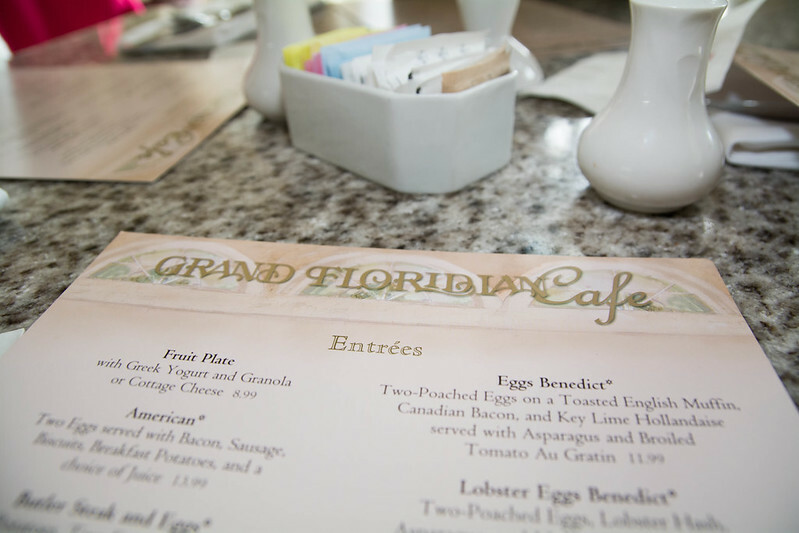 I had made us a breakfast reservation at the Grand Floridian Cafe at the resort because after driving through the night, a welcome breakfast is a necessity. 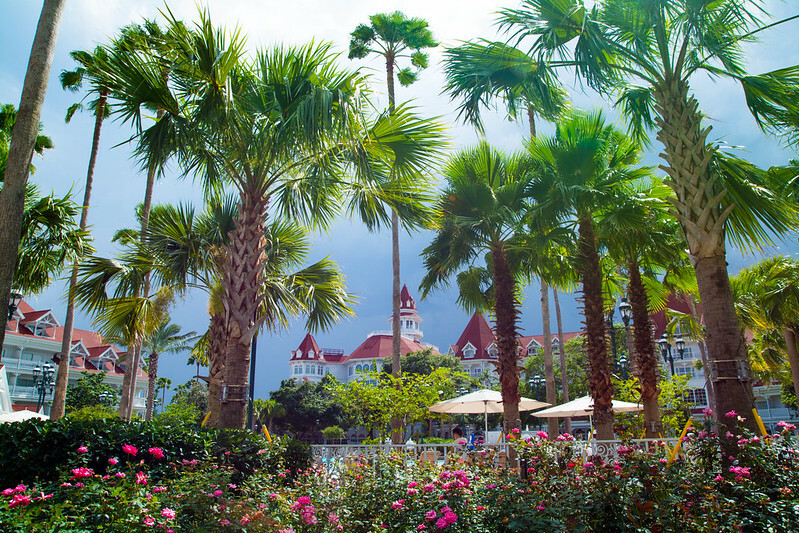 We had never eaten at the Grand Floridian Cafe before, and I was excited to try it. The restaurant is quite large and has a lovely, bright atmosphere. Also, service was quite fast. 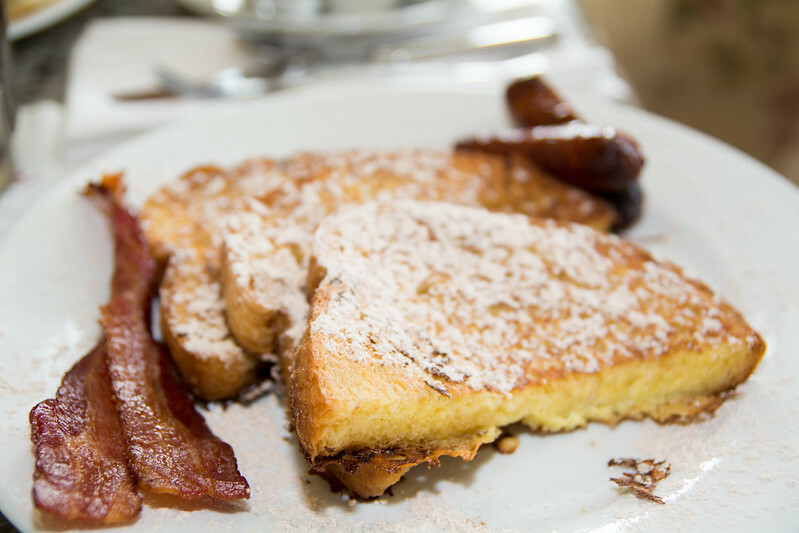 Rachel ordered the Vanilla-laced French Toast which I can confirm was quite delicious since I ate her last piece. 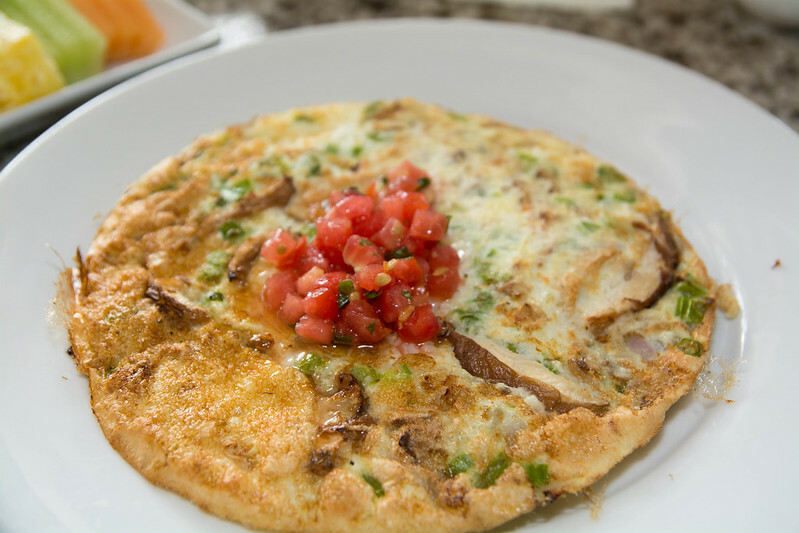 Mom had the frittata which she wished would have had cheese on it. 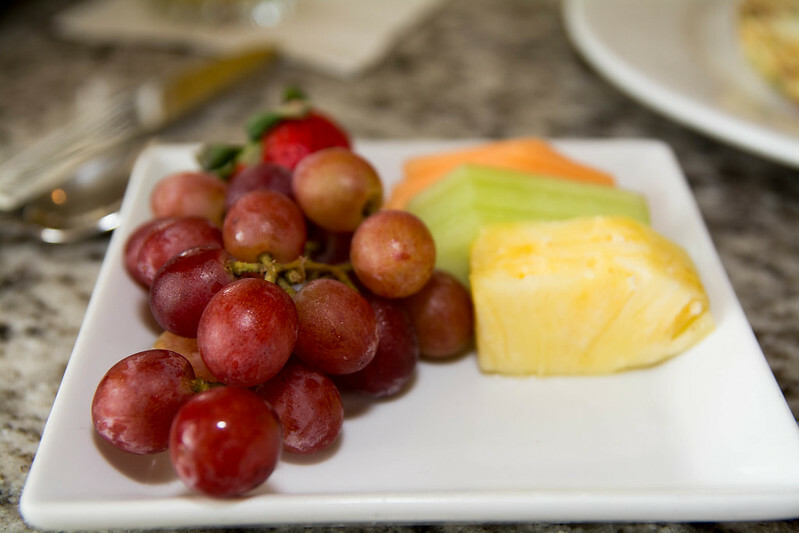 It came with fresh fruit. 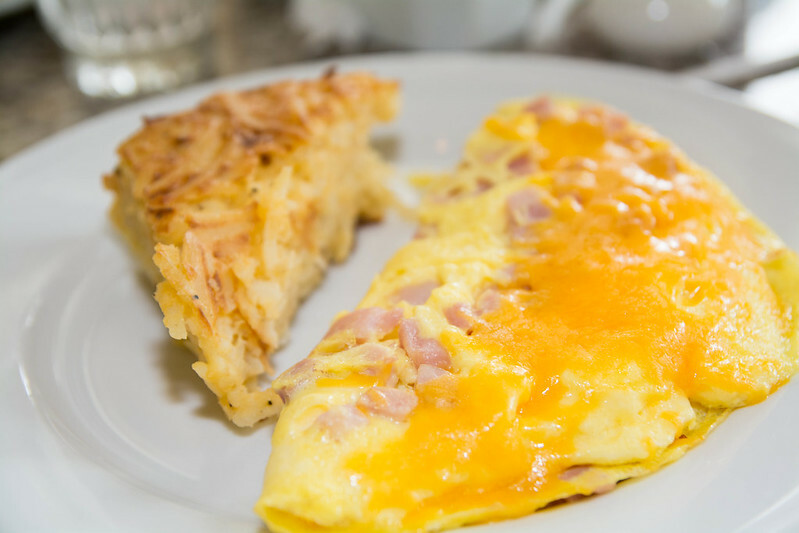 And I ordered the ham and cheese omelet which was really good... the hash browns, not so much. After awaking Rachel, we headed to the Magic Kingdom. We decided to take the boat since we were so close to it in Boca Chica. 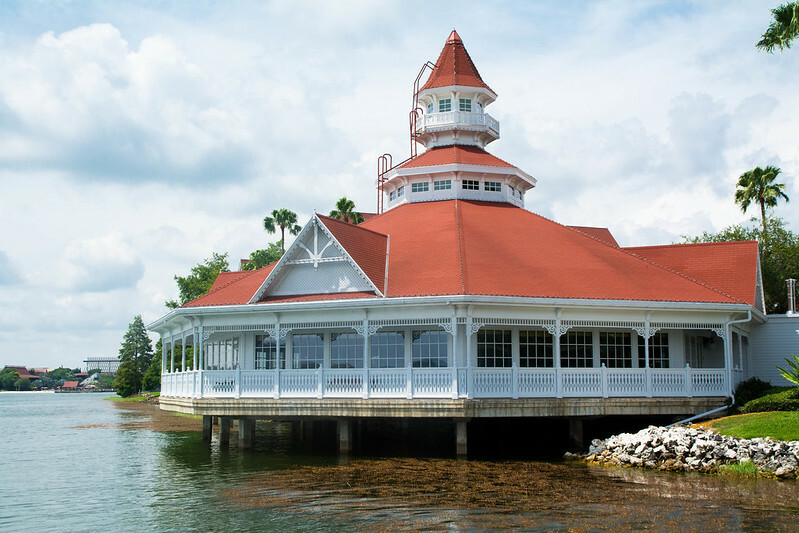 Narcoosee's, one of the Grand Floridian's three signature restaurants. 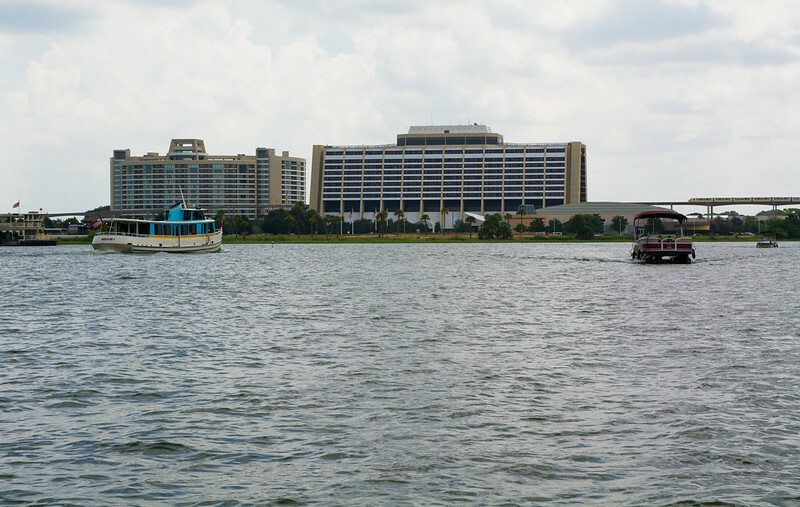 When headed to the Magic Kingdom using the water launch, the boat stops first at the Grand Floridian, then continues to the Polynesian to drop off/pick-up guests, then on to Magic Kingdom. 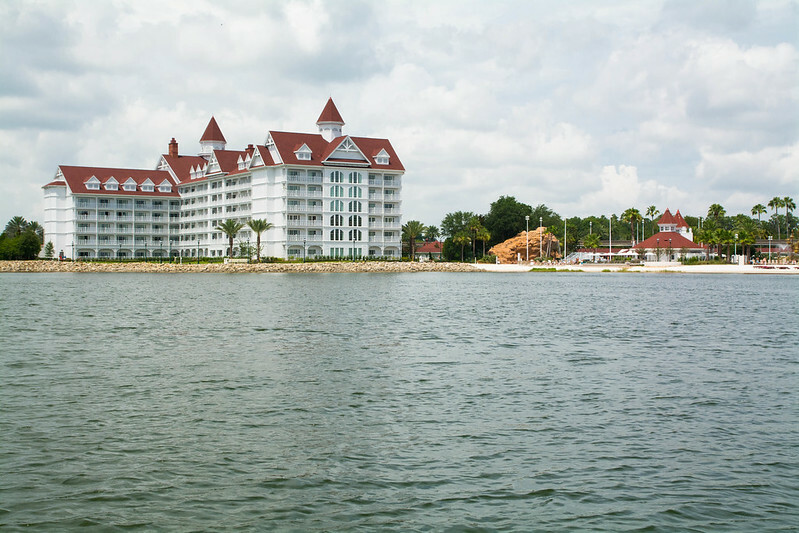 The boat ride to the Polynesian gave me great views of the new Disney Vacation Club addition to the Grand Floridian, as well as the new Disney Vacation Club bungalows being built over the water at the Polynesian. 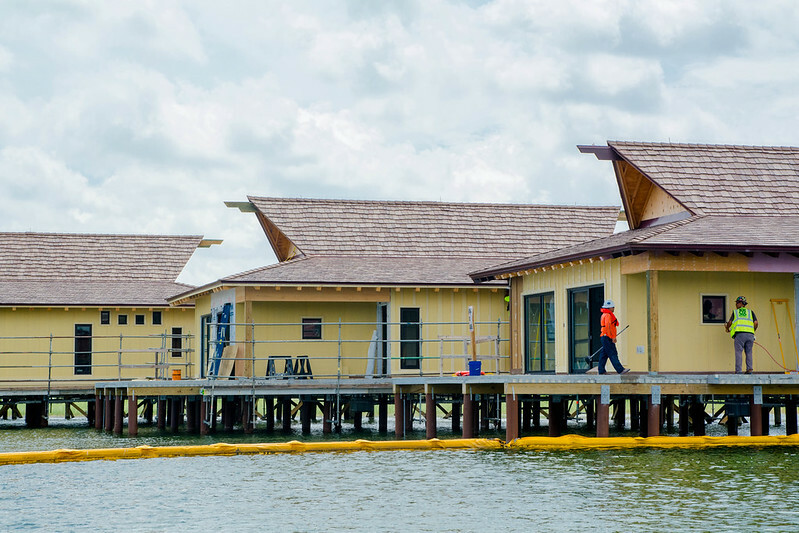 While the idea of an over-water bungalow sounds really cool, I'm not sure how I feel about it. 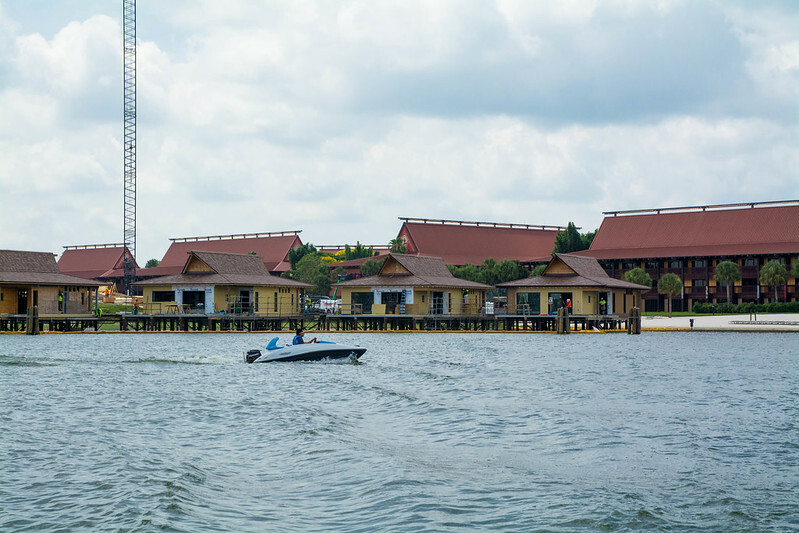 For one, these bungalows have not only significantly decreased the size of the Polynesian beach, but are obstructing the theme-park views from the Hawaii and Tahiti buildings. 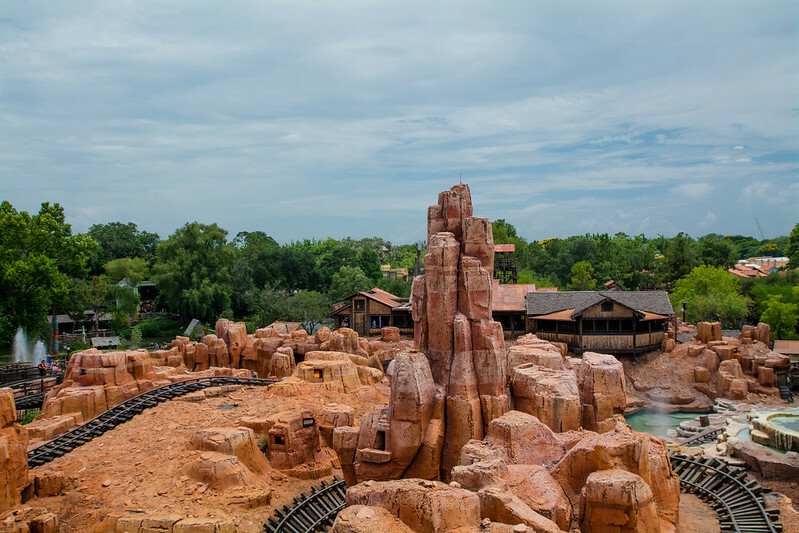 The theme park views from the Polynesian were considered by many to be the best, since the resort is directly across from the Magic Kingdom and provides a forward perspective of Cinderella's Castle. I suppose these views still remain... only now they are from the bungalows, rather than Hawaii and Tahiti. 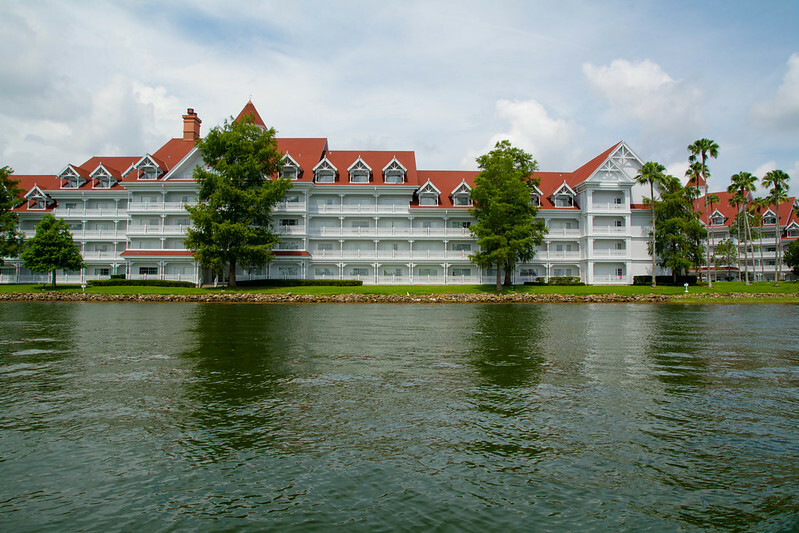 Scale is also a very important factor for me, and is my main complaint about the mammoth-size Disney Vacation Club building added to the Grand Floridian Resort. 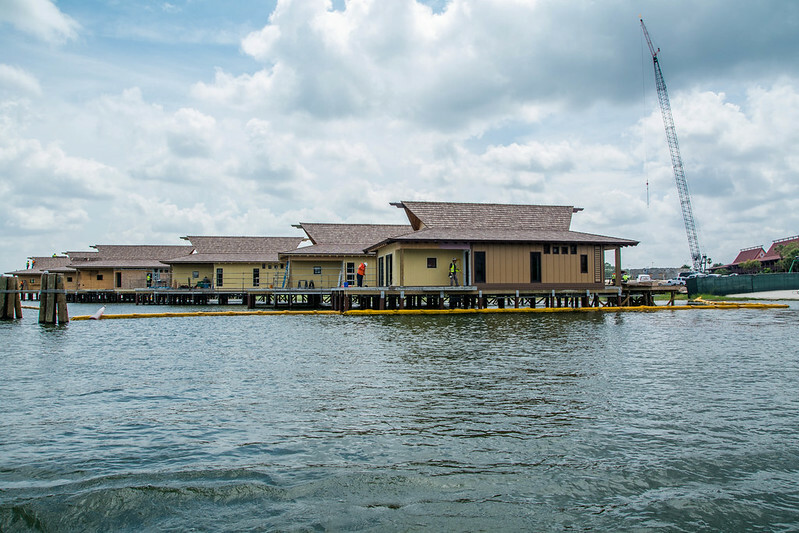 Perhaps it was my perspective, but I felt that the over-water bungalows were a little large in comparison to the three-story Polynesian buildings. To me, they don't feel so much like exotic hideaways, but rather over-sized vacation units. Now, if the Polynesian buildings were five stories tall, rather than three, the scale would feel much more appropriate. However, I believe the bungalows are a little too close together to really feel like a tropical escape. And my final issue (for now) with these bungalows is.... does this really make sense? 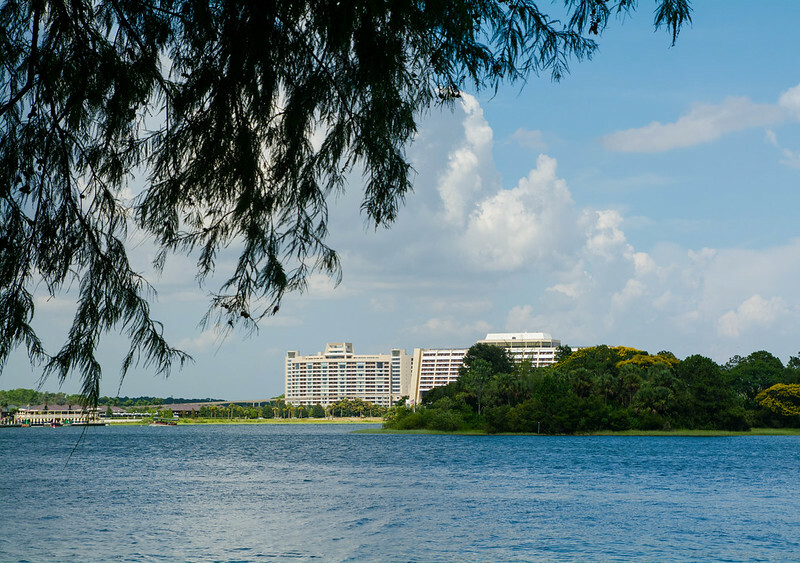 We can already no longer swim in the lakes at Walt Disney World due to bacteria which accumulates in stagnant Florida water. Not only that, but there are alligators. Freaking alligators! 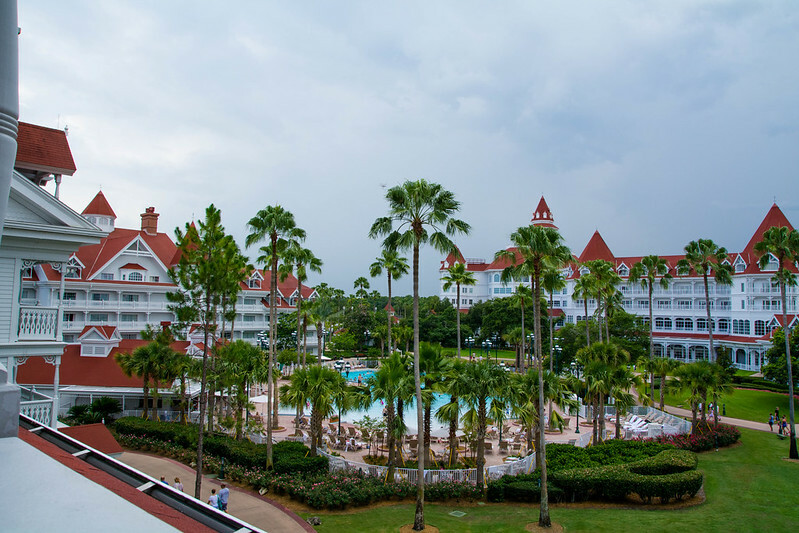 We used to own a condo on a golf course in Central Florida, and an alligator on the golf course was not an uncommon site... and there have been numerous gator sightings at Disney World. I don't know about you, but I definitely wouldn't want to come back home to an alligator sunbathing on the path to my over-water bungalow. 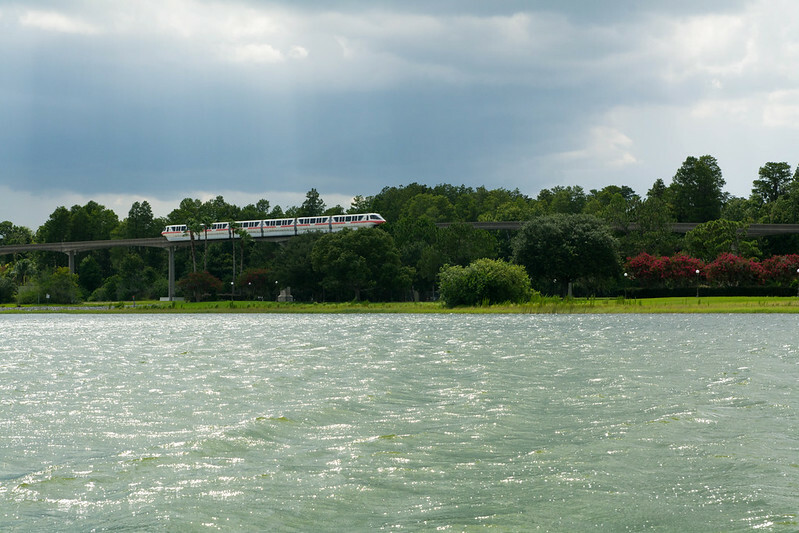 Of course, Disney did operate River Country, a water park in Bay Lake for 25 years, and I haven't been able to find any reports of visitors getting attacked by alligators, so perhaps I'm over-thinking things. We had arrived in time for our Space Mountain FP+.... only to learn that Space Mountain was temporarily closed. 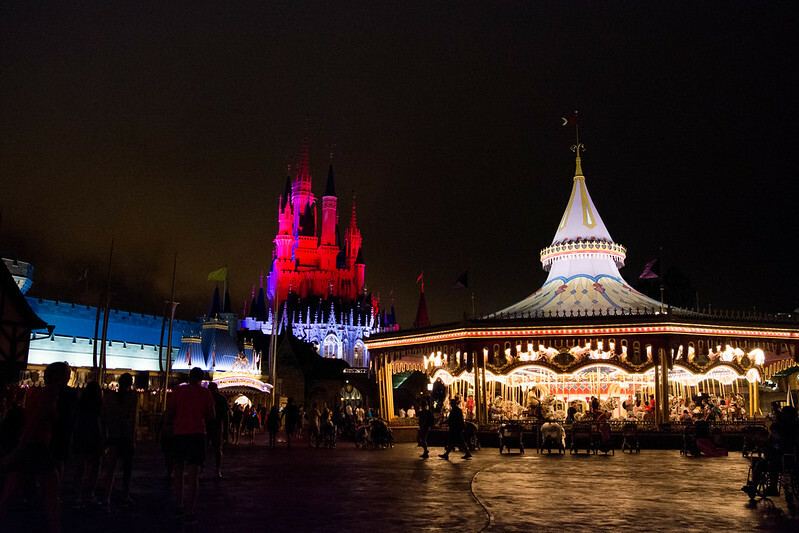 No problem, our FP+ would be available for several different Magic Kingdom attractions, including Space Mountain, until 1 AM. So we got out our My Disney Experience apps and checked nearby Wait Times. I made a comment about how we have never done Stitch's Great Escape (because we heard it was terrible), so Dad decided it was about time we tried it. We actually had to wait about 15 minutes until the next show. For the record, it's pretty terrible. 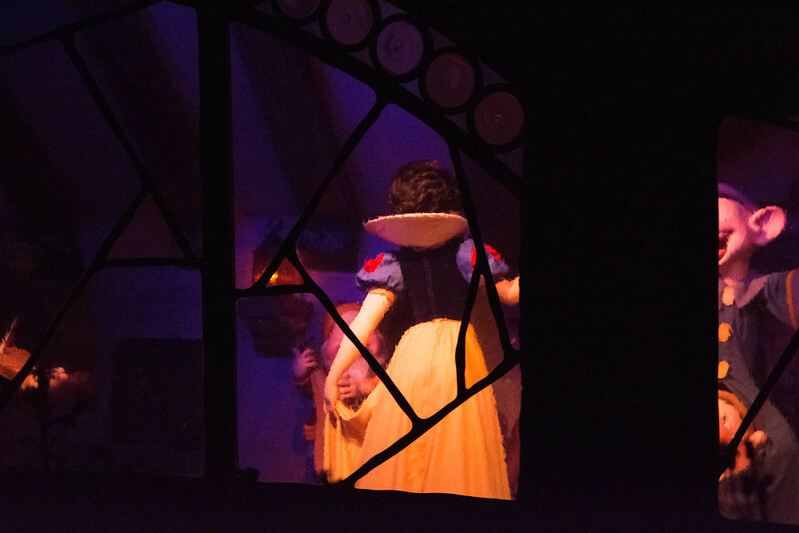 I will rate it the worst attraction in all of Walt Disney World, though I didn't feel particularly robbed of my time since I knew it was going to stink (literally) going in. It's essentially the exact same set up as ExtraTERRORestrial Alien Encounter which had previously occupied this building (1995-2003). 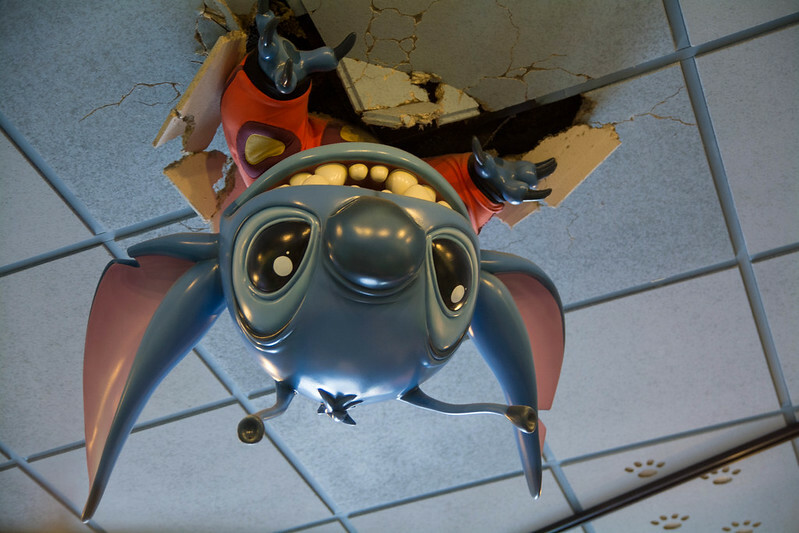 The only difference is that they replaced the creepy alien with Stitch. So it's not quite as scary, though there is a short period of time when the room becomes pitch black. Also, the over-shoulder restraints are quite painful and will crush your shoulders repeatedly as Stitch jumps up and down. 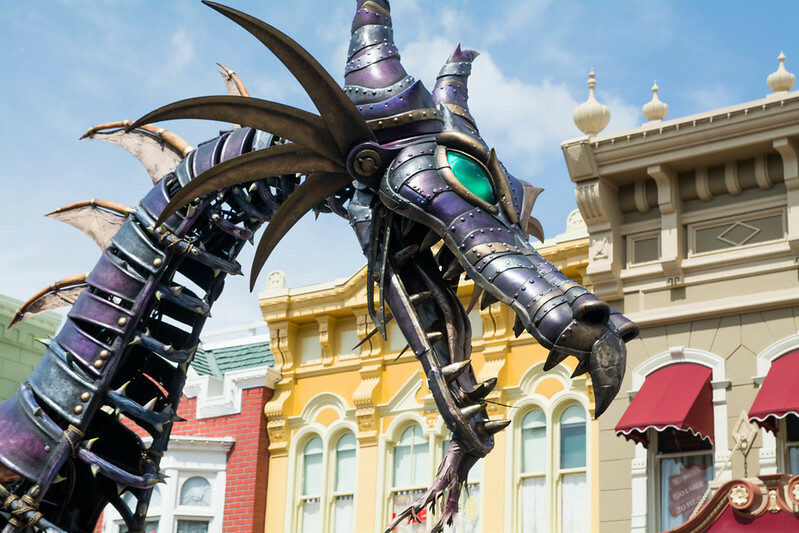 My final thoughts are.... this attraction is really bad. Don't wait for it. 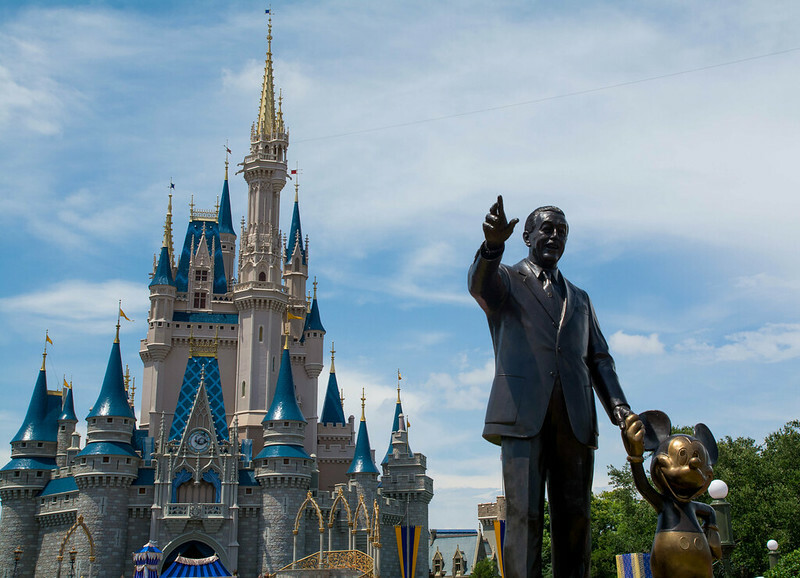 If you are going to Disney World for the first time or have just a short visit, I would recommend not wasting your time. But if you're a repeat visitor who's curious, check it out - because hopefully it won't be there for much longer. 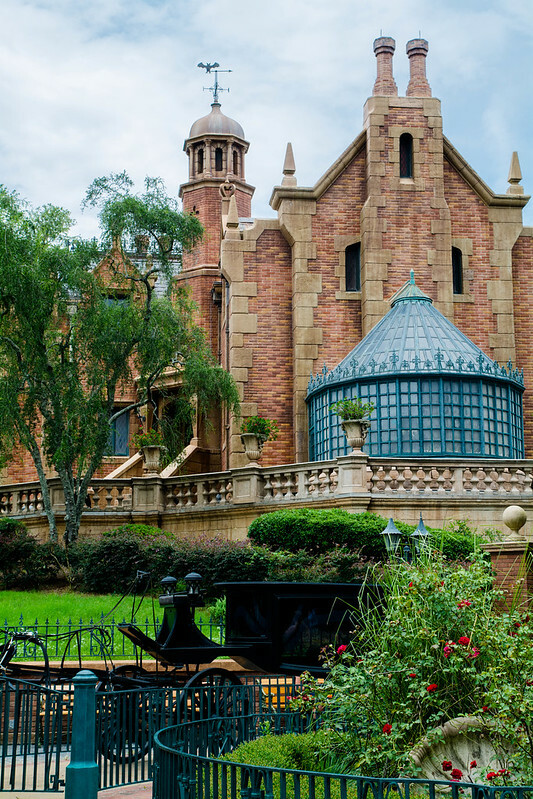 We headed towards Liberty Square to visit the Haunted Mansion. 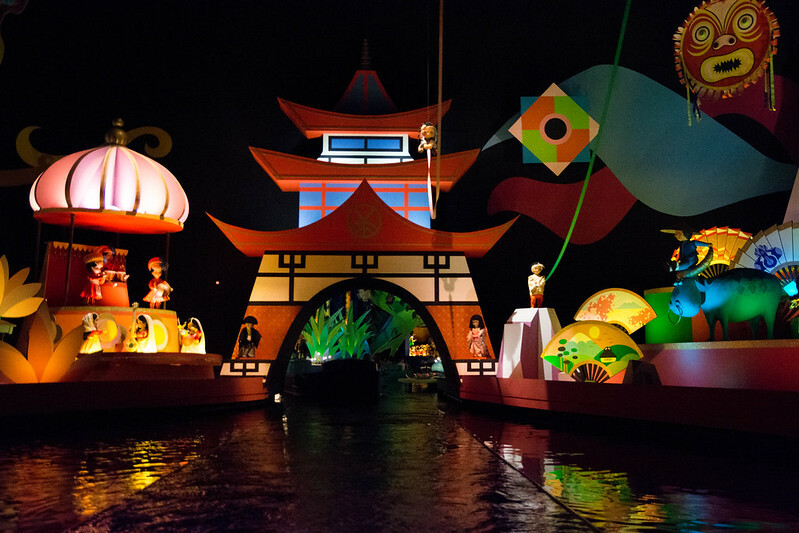 This is attraction which I didn't do too much as a kid (maybe I was scared... but mainly I remember the lines were always long), but I really appreciate now. Every time I ride, I notice something new. The details in this attraction are excellent. 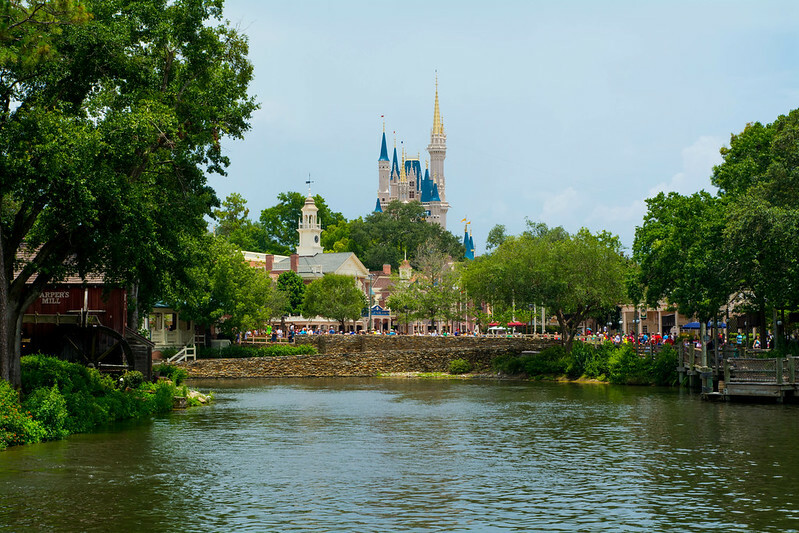 There is a wonderful view of Cinderella's Castle from the lagoon-side pathway to Big Thunder Mountain in Frontierland. I'm taking note because I think this would be a really, great "off the map" place to watch Wishes. 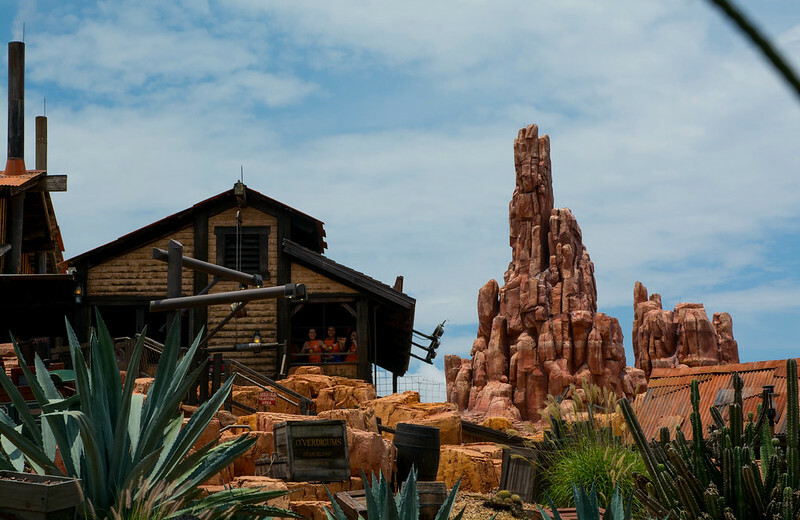 We were a bit early to our Big Thunder Mountain FP+. You can use your FP+ up to 5 minutes before your designated return window, or up to 15 minutes after. However, I didn't want to take any chances since Big Thunder was one of our optional replacement attractions for our Space Mountain FP+. 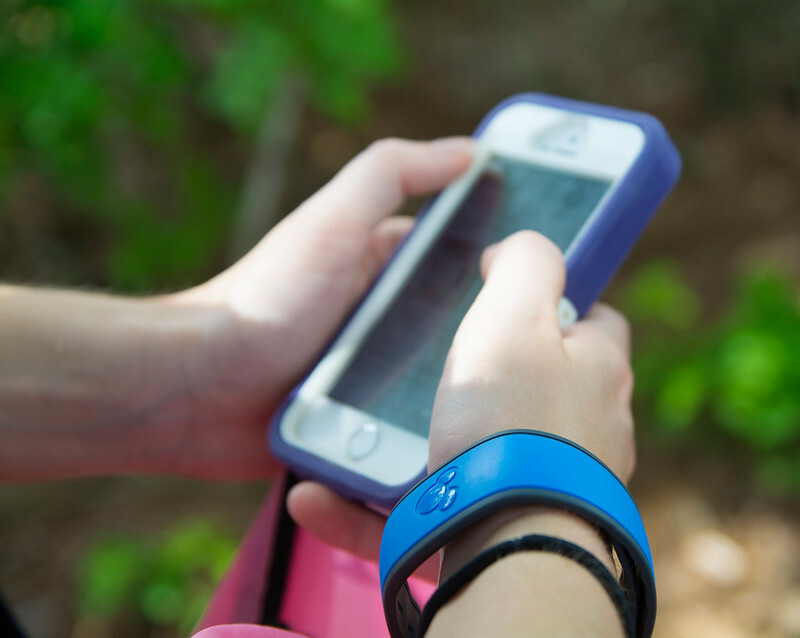 Four Magic Band-wearing trips later, Rachel finally downloaded the My Disney Experience app. I'm a fast walker, but I often find myself struggling to keep up with my family as I stop to take photos. They aren't completely accepting of my "stopping in random places to take pictures". 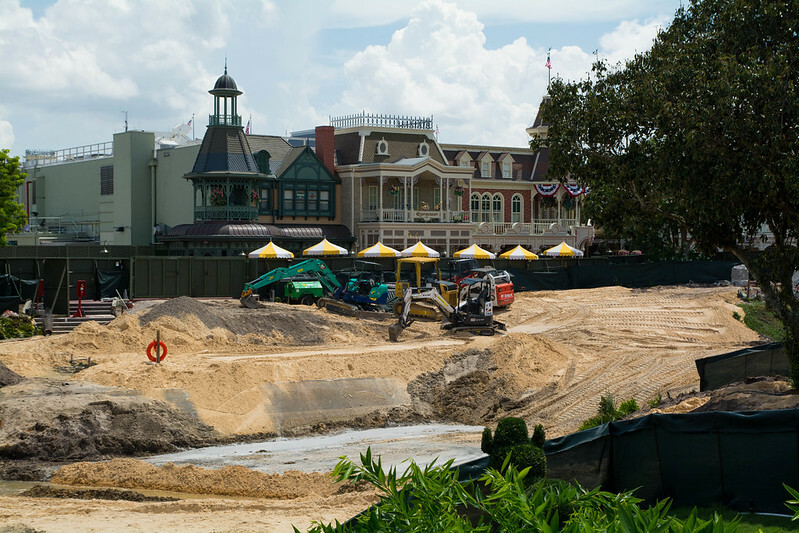 Castle hub expansion is underway. 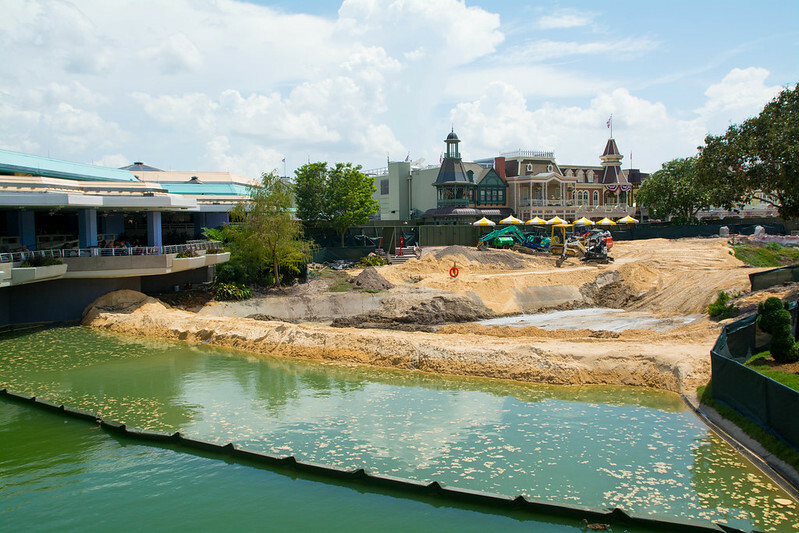 While I'm a bit sad to see them filling in more lagoon, the added space will hopefully help minimize congestion along Main Street and in the Castle Hub in the evenings. After successfully making up our Space Mountain FP+, we had to do a little shopping before heading back to our resort. 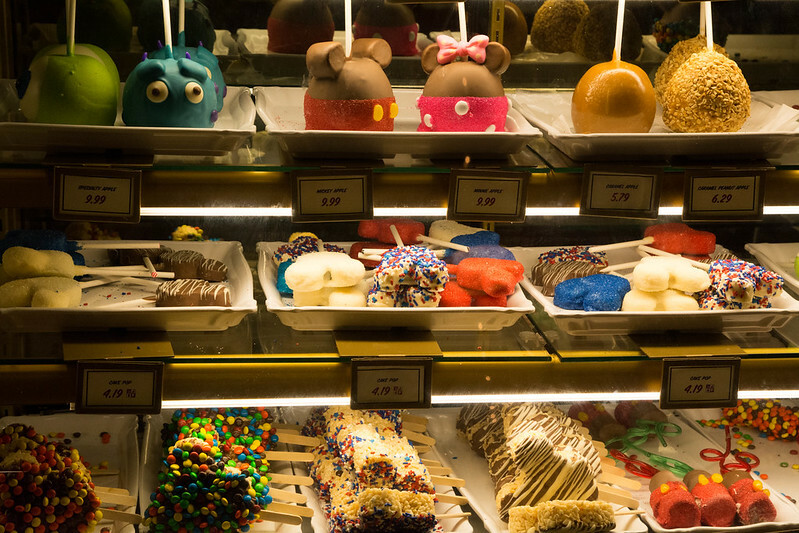 We were looking for 4th of July Minnie Mouse ears, and successfully found them in the Emporium on Main Street. 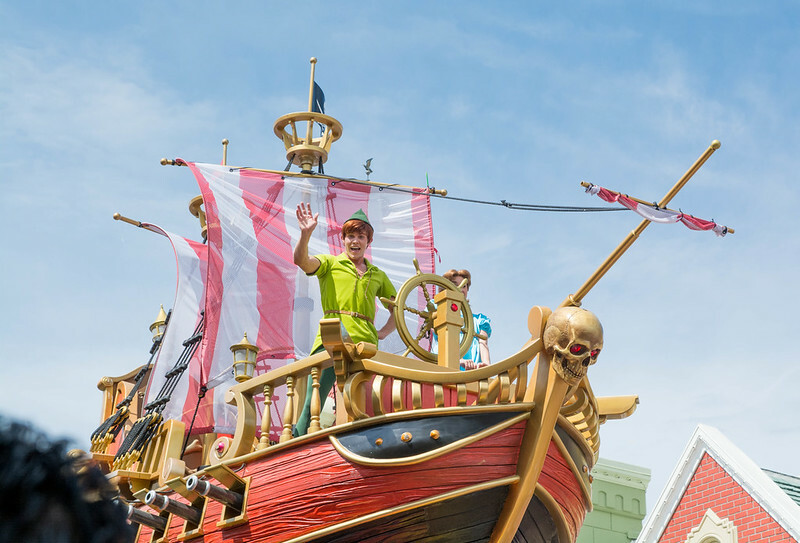 It also happened to be time for the 3:00 Festival of Fantasy parade. We took the boat back to the resort. 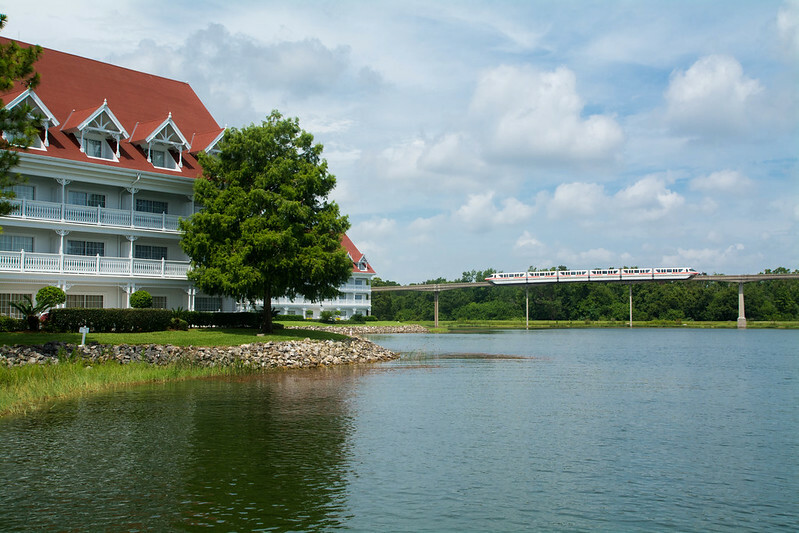 Since the Grand Floridian is the first stop back from the Magic Kingdom, if the boat is coming and there isn't a long wait, it's typically faster to take it rather than the monorail, on which the Grand Floridian is the fourth stop back from Magic Kingdom. The entire trip, we had exceptional timing when it came to beating afternoon thunderstorms. 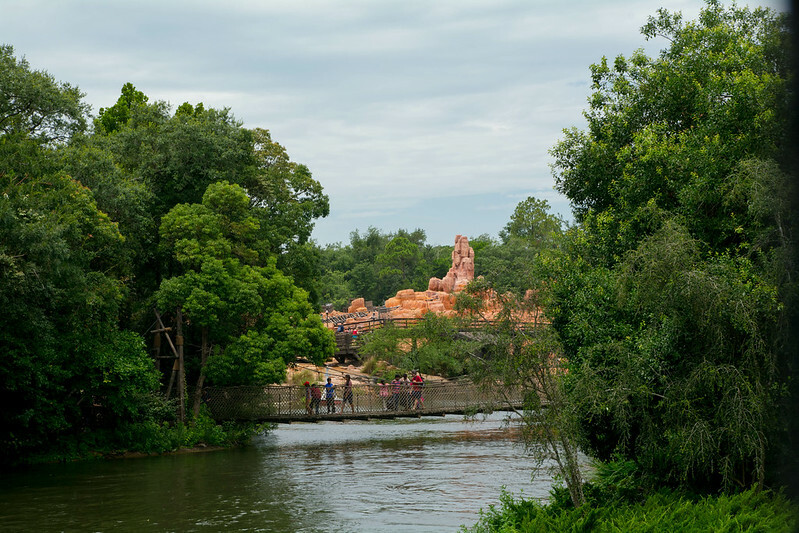 Never were we caught in the parks during a torrential downpour. Of course, my dad was upset because he never got to enjoy the pool in the afternoon, since it was always raining. Woke up from my afternoon nap, checked my phone.... 8:00 PM!!!! Wake up, guys! Wake up!!!! The pre- July 4th Celebrate America Fantasy in the Sky fireworks were at 9:00 (for Holidays like New Year's Eve or Fourth of July, Magic Kingdom shows its holiday fireworks the night before the holiday, as well, in attempt to lessen crowds the next night). So the story behind the following photos is not that I was looking for a distinctly American foreground like the train station, but rather that I overslept and had to be creative. I was in a bit of a panic as to where I was going to set up, as my MeFoto backpacker tripod is not that tall. 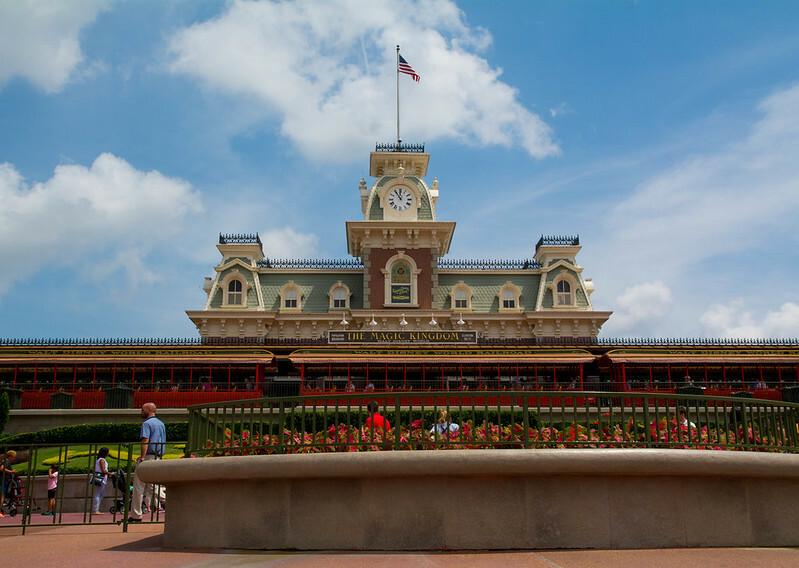 I knew that by the time we got to Magic Kingdom, Main Street was going to be packed. Even if I could find a vacant spot on a bridge somewhere, it was unlikely that I'd be able to fight the crowds on Main Street to get there. Ideally, I would have liked to shoot from on top of the train station, but I knew that domain was probably taken by other photographers who had been staking out the spot for hours. 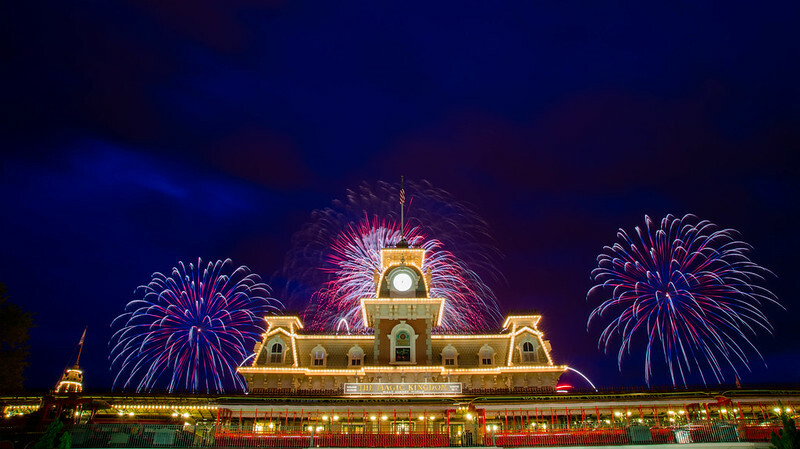 On the monorail to Magic Kingdom, I realized that I could probably shoot the fireworks from outside of the park, over the train station. Unfortunately, my vantage point was a little low, and I wish the fireworks were higher above the station. 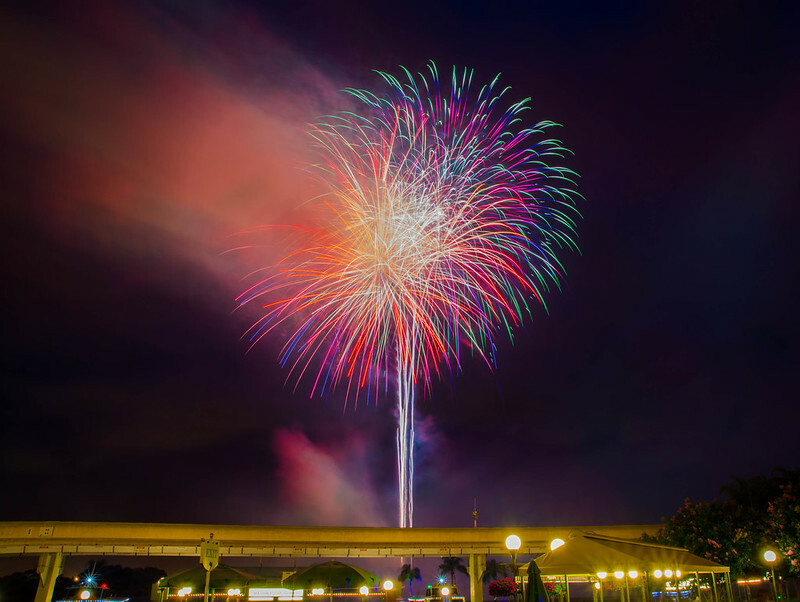 However, the good thing about the Celebrate America fireworks is that the show is also shot over the Seven Seas Lagoon, so I was able to watch the show behind me, as well. Rachel said she didn't really like this spot because she didn't know which way to look. 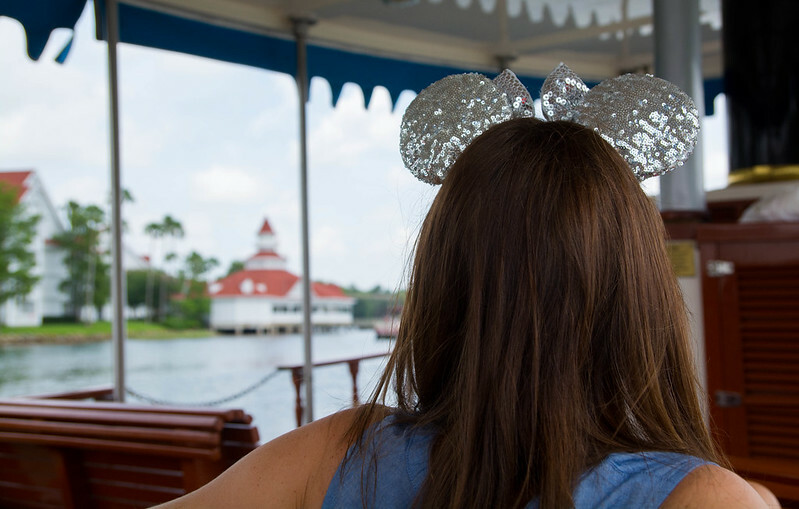 Also, for her photos, she likes having something prominent in the foreground like Cinderella's Castle, so she only liked shooting behind her when a monorail was going by. This position did allow her to get a pretty awesome panoramic video of the finale, though. After the fireworks concluded, we entered Magic Kingdom. 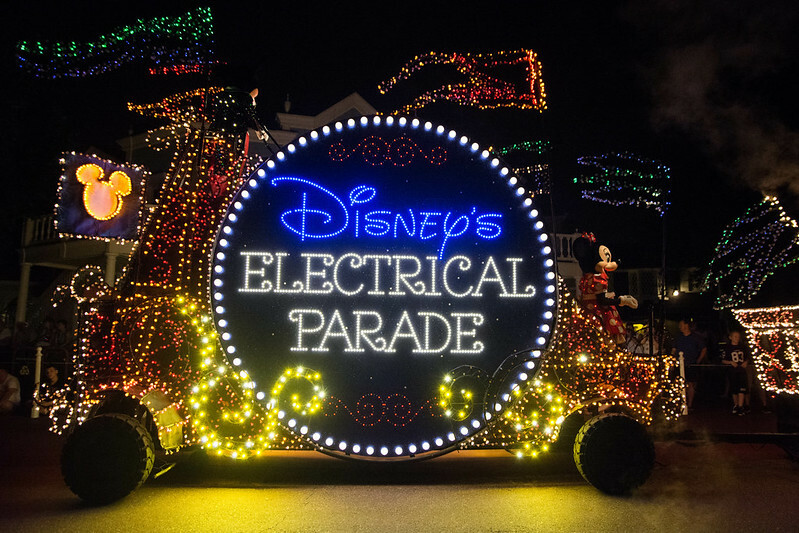 People were lining up for the Main Street Electrical Parade, so navigating down Main Street was an absolute nightmare. We made it about halfway down Main Street when we hit a stop. And somehow, we all got separated. Or at least I got separated. It started raining, and the people around me were getting really frustrated. One man was shouting terrible profanities, and I turned to give him the eye and perhaps tell him to watch his mouth, when I realized that he was holding a small child of his own who clearly did not have virgin ears, so I decided it best to mind my own business and passive aggressively complain about the situation on my blog later. 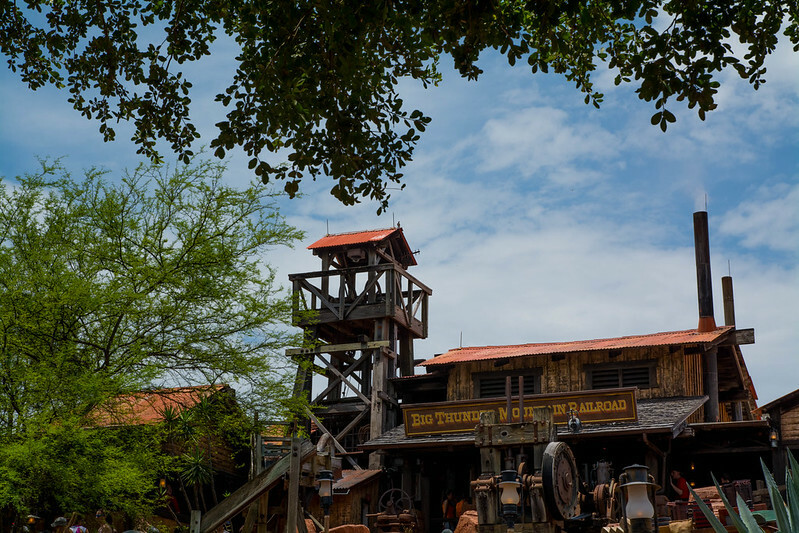 We had a plan to meet at Pirates of the Caribbean, and I was the last to arrive. When I finally got there, Rachel was really upset because a female cast member had grabbed her on both sides of her shoulders (apparently after yelling after Dad who she couldn't catch, she decided to take her frustration out on Rachel) to tell her to go a different way. And then when Rachel asked her how she should get that way, the cast member turned and started shouting at another man. So Rachel went the way she wanted to go, anyway. 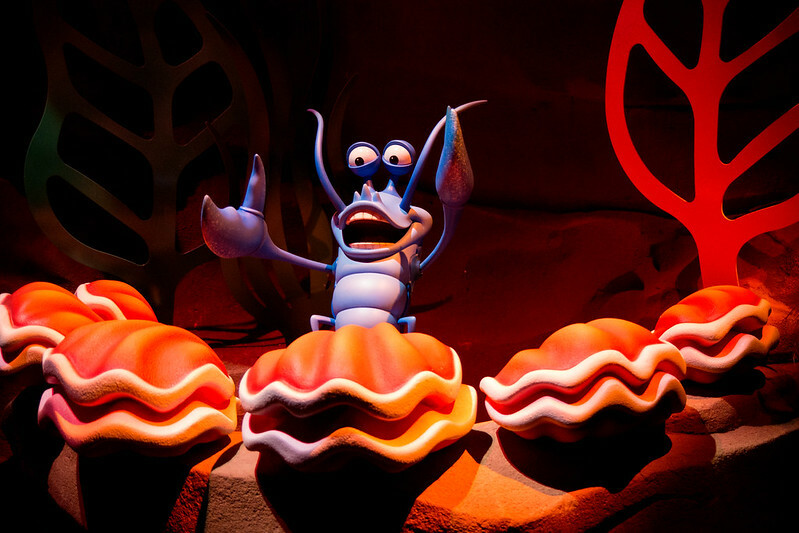 There is no question that managing crowds at Disney World on holidays is a difficult job and one which only those who have the ability to remain calm in high-stress environments should be employed to do. I suggested that Rachel should have placed her hands right on top of the cast member's shoulders, and calmly asked her if she felt comfortable being held like this by a stranger, then reminding the cast member that especially in today's world where people are fast to cry sexual harassment, it is not acceptable to touch people. 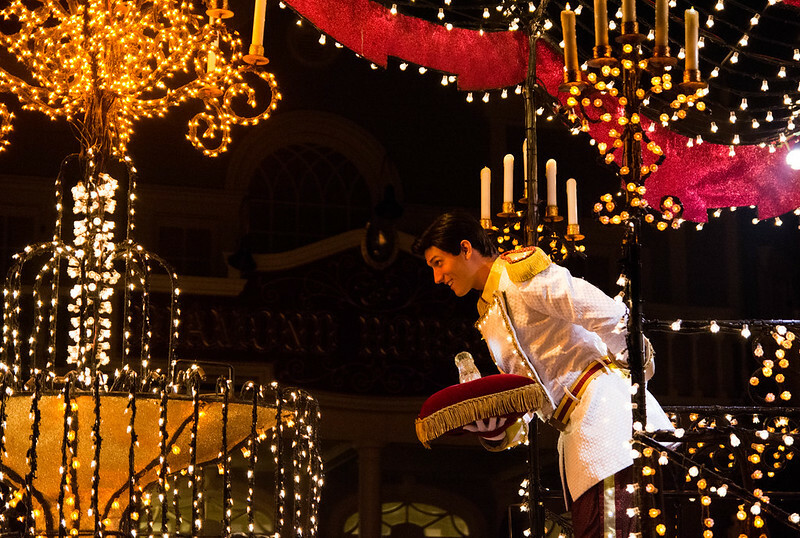 In all seriousness, there were several cast members working crowd control that night who were losing their temper. I understand it's a high-stress job, but they need to remember that becoming visibly agitated only worsens the situation. After all of the commotion at Pirates of the Caribbean, we didn't even get in line to ride because Rachel was too peeved at the Cast Member. 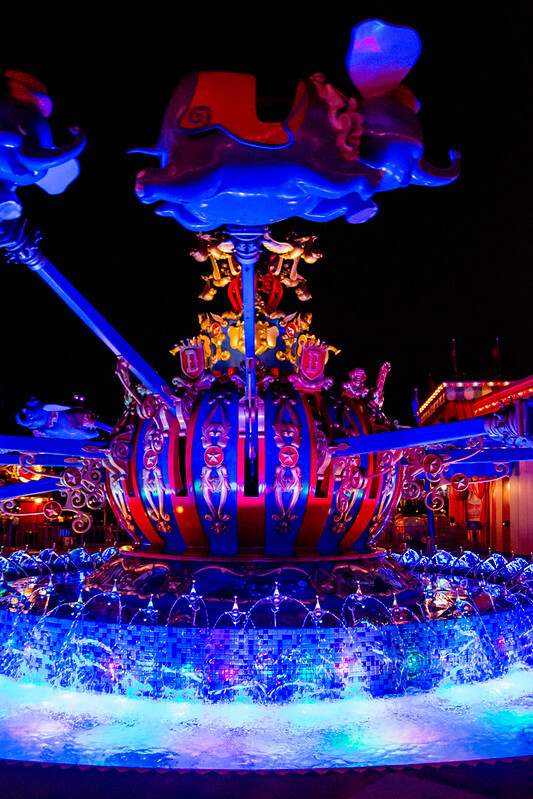 So we walked towards Fantasyland and then realized that we hadn't eaten dinner. 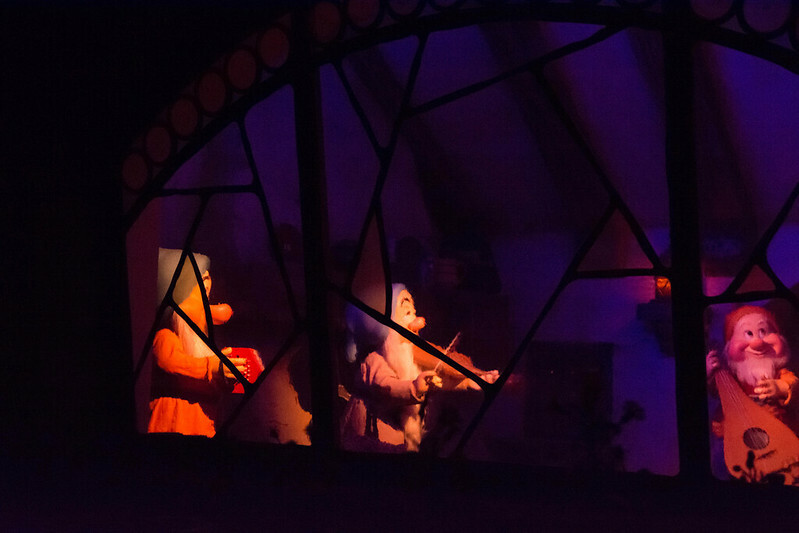 We headed to Pinnochio's Village Haus, a quick service eatery next door to it's a small world. 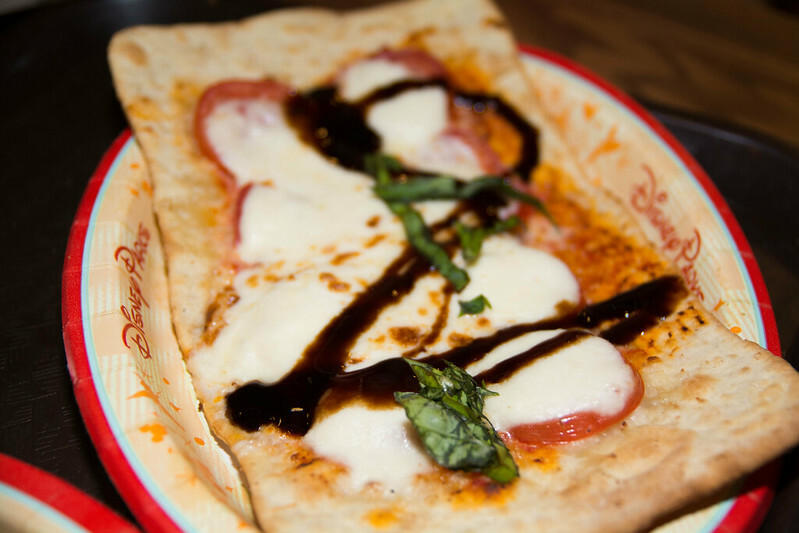 I'm not exactly sure when the menu was upgraded, but when we ate there after our Disney Fantasy cruise, I learned that the pizza had been upgraded from the standard theme park pizza to more Italian-influenced flat breads. Rachel and Mom had the Caprese flat bread. 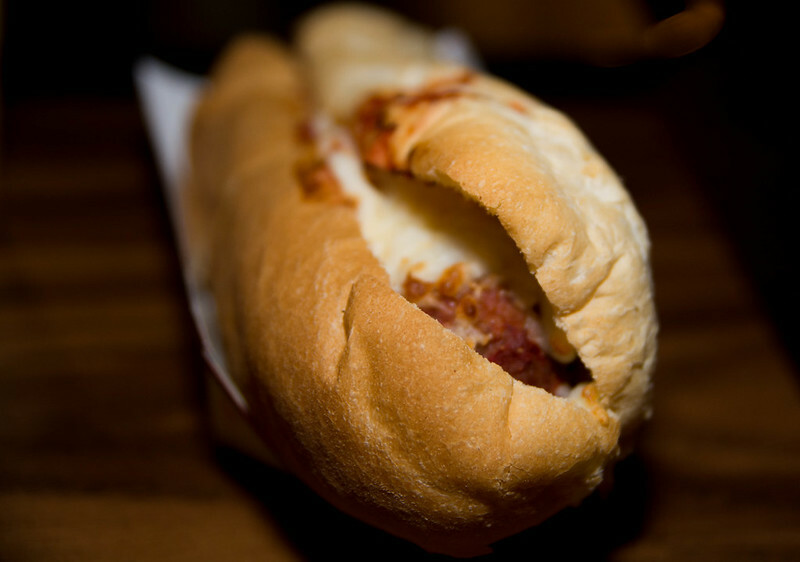 And Dad tried the meatball sub, which he thought was too much bread. 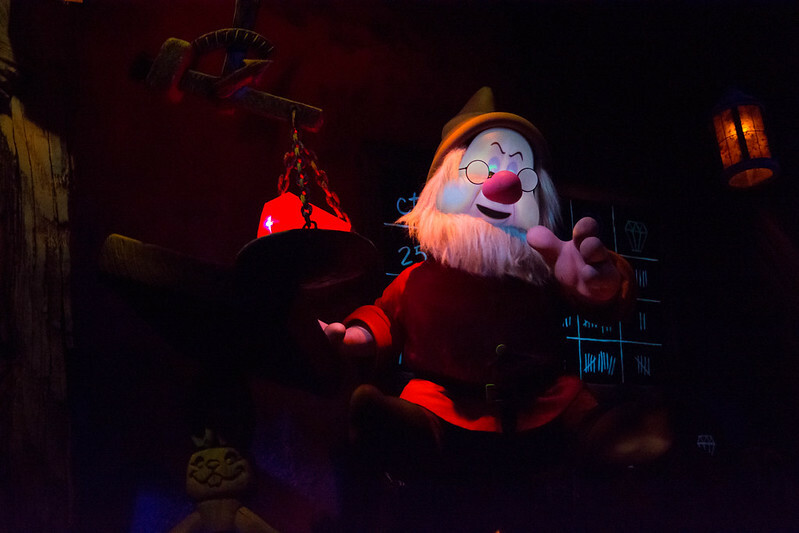 When we stopped by after our Disney cruise in May, we were teased by the cast member testing of the Seven Dwarfs Mine Train, the final edition to the New Fantasyland expansion. 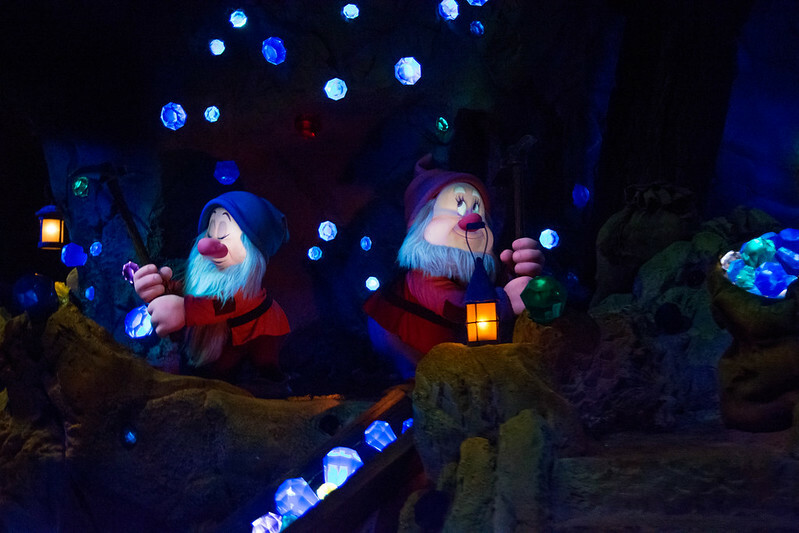 So after deciding to come to Disney for the Fourth, I was quick to get on My Disney Experience and secure two FastPass+ during our stay for the Seven Dwarfs Mine Train. 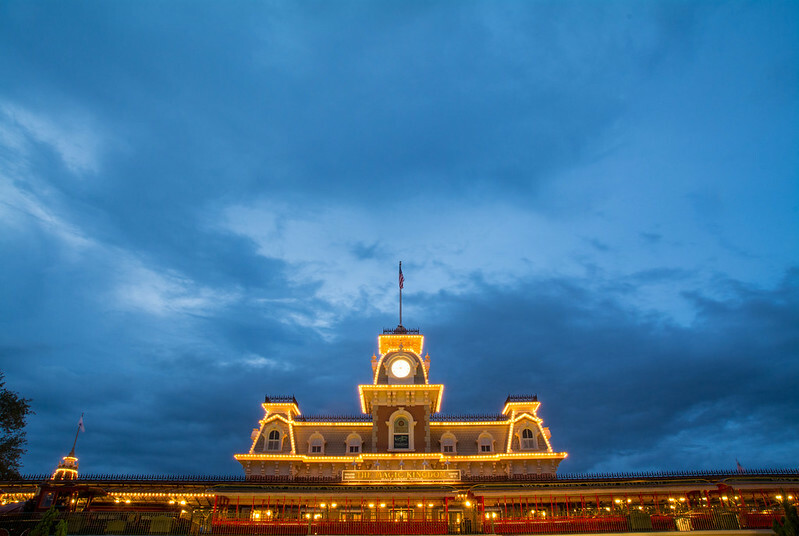 The 10:35 PM FP+ was the soonest I could get for our arrival day. As we were lined up for our mine train, the young guy behind us about our age looks at us and says, "Are you girls ready to ROCK?" "Yeahh," Rachel said, not knowing what he was talking about. "You rock the car from side to side." "We've never done this before! You're ruining this for us!!" I told him. "No, no! It makes it better, I promise." He was really good at rocking the car, and he was right, knowing that you have to rock the car made it better because I watched our parents in the car ahead of us, and they weren't rocking. 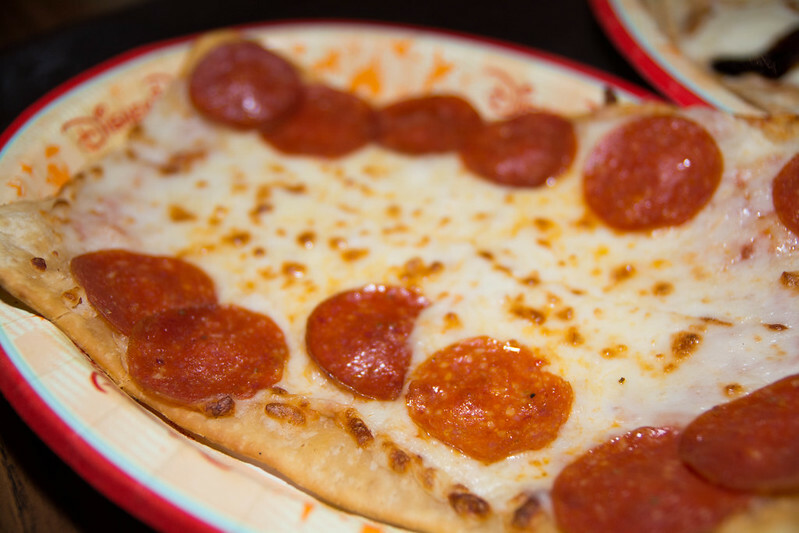 While the coaster itself is quite mild, the technology is really cool. The tracks are so smooth, and rocking the car from side to side makes the ride more interactive and fun. 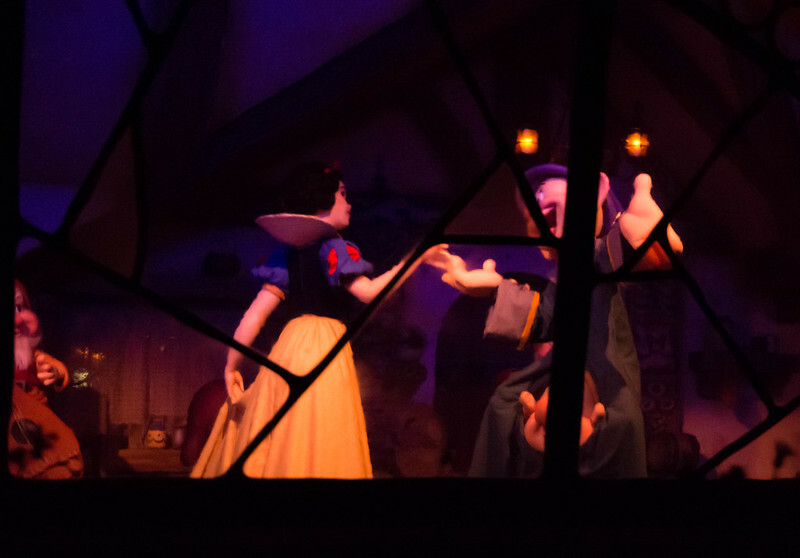 Also, this attraction mixes a coaster with a dark ride, with scenes from Snow White and the Seven Dwarfs in the middle of the coaster, as well as at the end of the ride. Our only complaint is that it didn't seem quite long enough (especially for people waiting in the stand-by line). 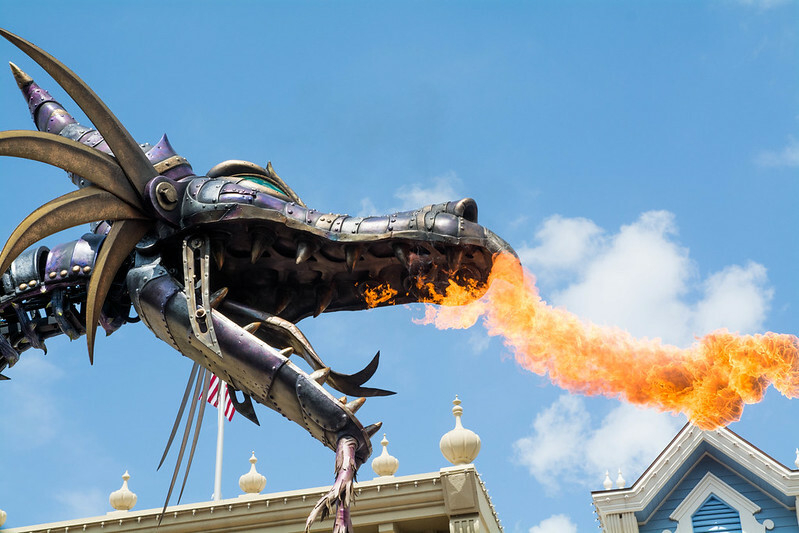 However, I think this is a great addition to the Magic Kingdom as a "thrill" that will appeal to a wide variety of ages. 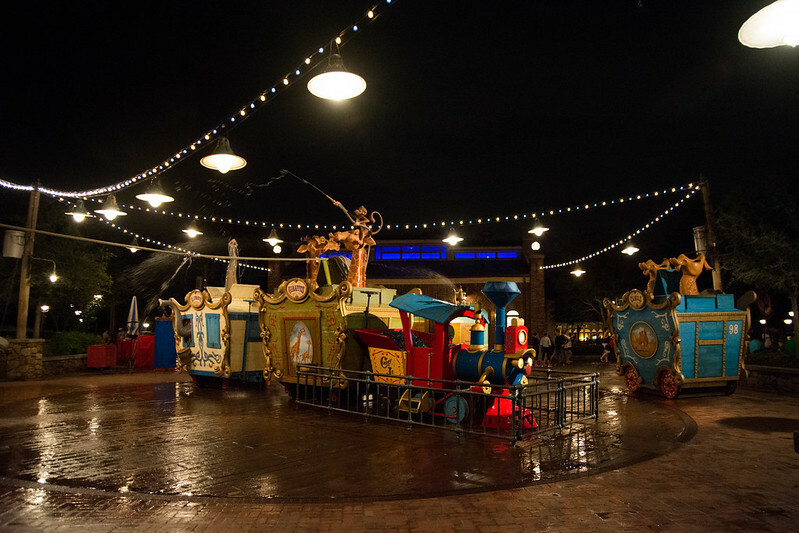 Night time is a great time to hit the Fantasyland attractions because most of the kiddos have gone home. We took this opportunity to ride Dumbo at Storybook Circus. We then checked out the store in the Big Top tent. I don't believe I had been in there before. 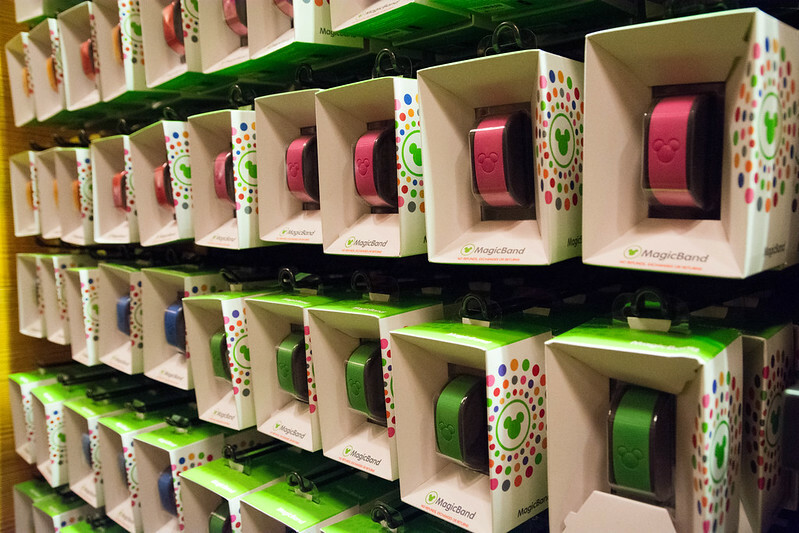 It is one of the many locations now selling Magic Bands. 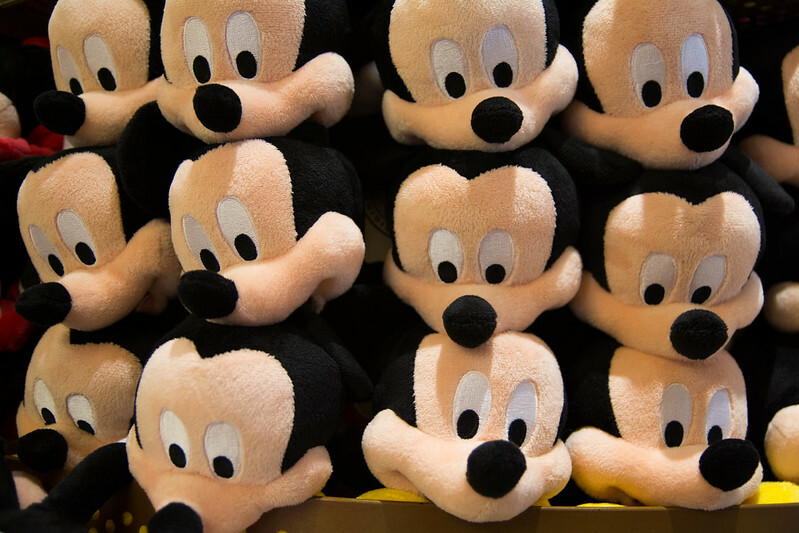 While Magic Bands are automatically provided to guests staying at a Walt Disney World resort, as well as annual passholders, the bands can be purchased by off-site guests for $12.95. 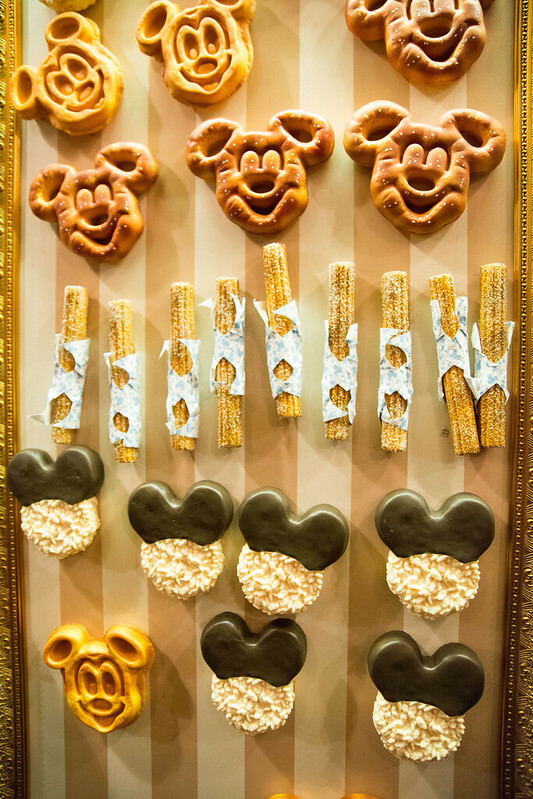 The store also has these adorable Disney Park treat magnets. 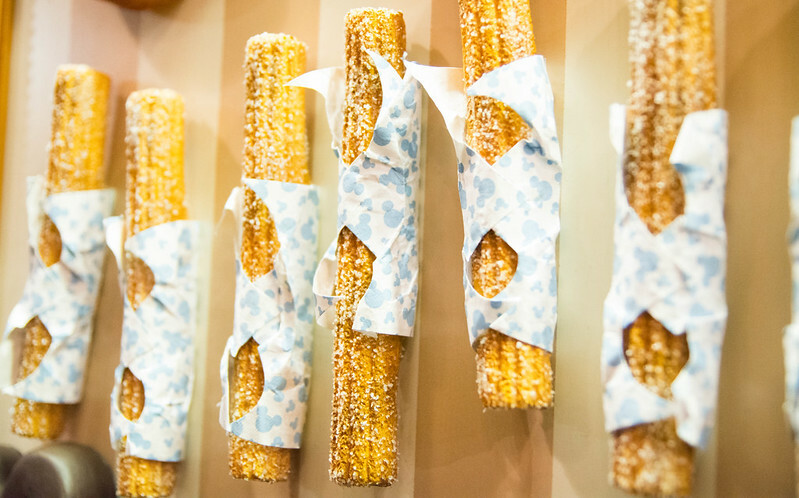 As well as real treats. 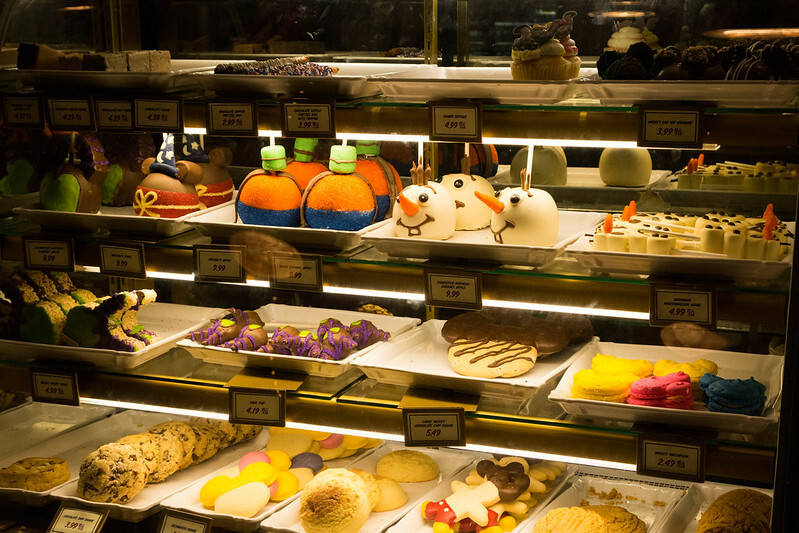 Disney has the most adorable baked goods. We dared one another to run through the splash area and watched a few crazy kids soak themselves. 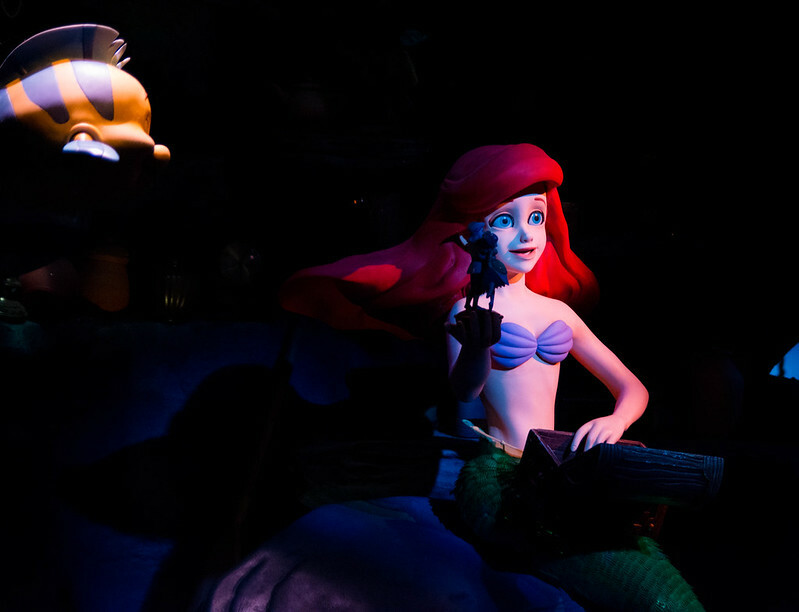 Then walked right on The Little Mermaid: Ariel's Undersea Adventure which is in my opinion the best "classic" dark ride at Walt Disney World. 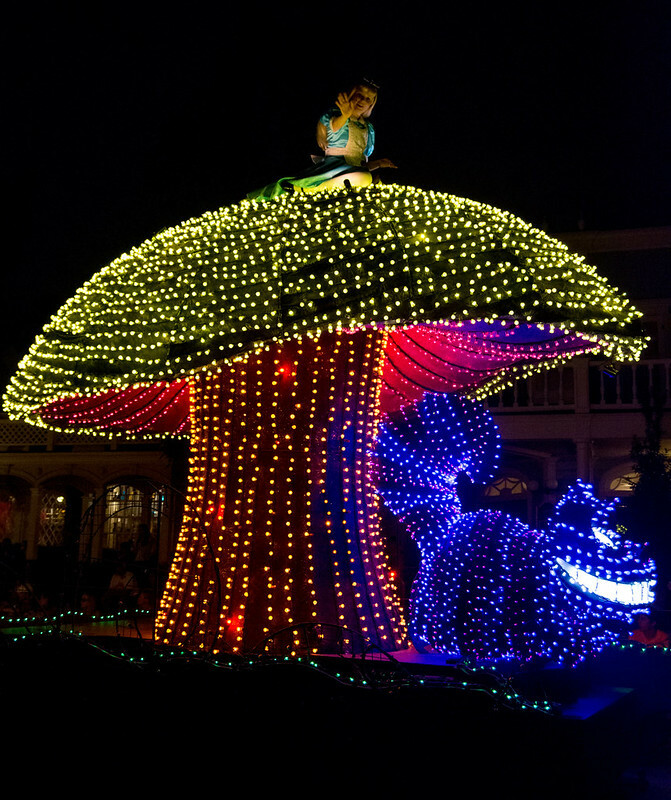 Ride this and then Peter Pan's Flight (which opened with the park in 1971 as a lengthened version of the Disneyland version of the attraction which opened with its respective park in 1955), and you'll have a strengthened appreciation for how far technology and animation has come in the past 40+ years. 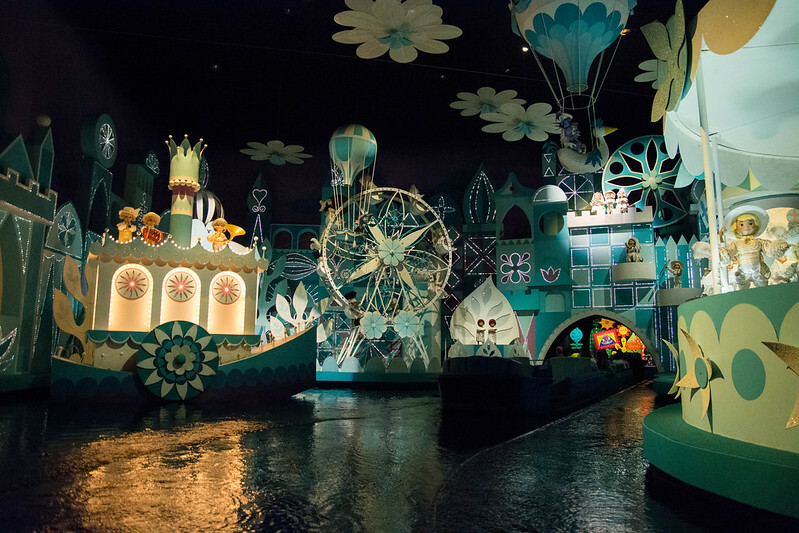 And then one of my mom's favorite attractions is it's a small world. It's the first time in a while that I've been seated in the front of the boat, so I took advantage of the opportunity to take wide-angle photos of the entire room. Again, we looked for the word 'Mexico' written out, as we were told it was the only country written out at our Disney trivia on the Disney Fantasy. We've determined that they must have been referring to the Disneyland version of the ride, as we have searched incredibly hard at Walt Disney World.... though I've done some heavy internet researching and have yet to find this "fact" online, so I'm beginning to doubt its accuracy. 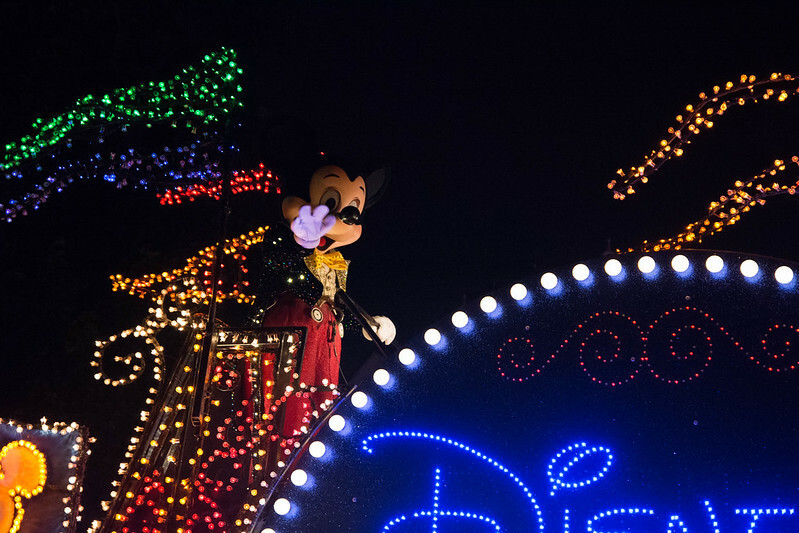 If when about to leave the park, you find yourself trapped by the Main Street Electrical Parade, you might as well stop and watch. We found a great spot behind a family sitting on the ground. Honestly, I think it's been a long time since I've watched this parade standing up in a good spot. Also, I felt like a celebrity because ALICE SPOKE TO ME! 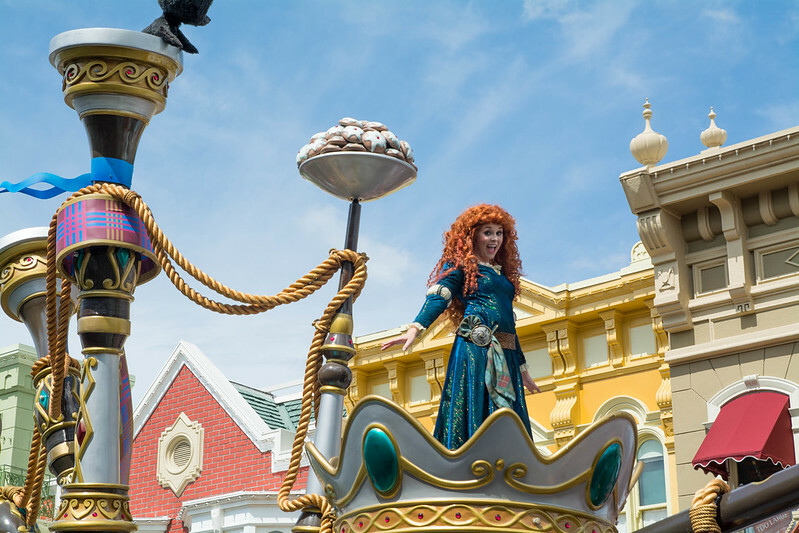 Big cameras usually catch the characters' attention for at least a few moments during parades. Alice looked down and waved, saying, "Hello, camera!" I lowered my camera and waved back to her. "You have such a beautiful smile! Your camera blocks it." How sweet. Thank you, Alice! Earlier this summer, I was photographing a group of high school girls, and one was named Elliott. "Elliott! Like Pete's dragon!" She looked confused. "Have you seen that movie?" "No, I've never heard of it." 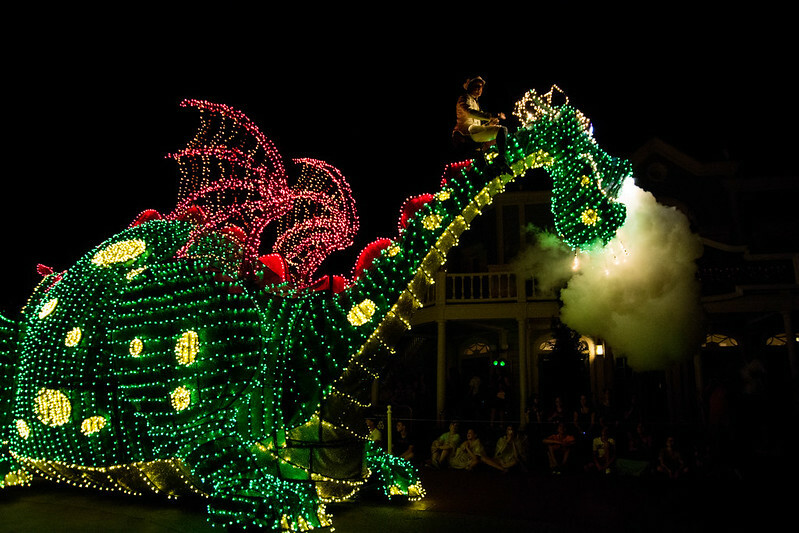 And according to a recent Buzzfeed article, Why Pete's Dragon is the most Disturbing Disney Musical Ever, perhaps there is good reason for that. 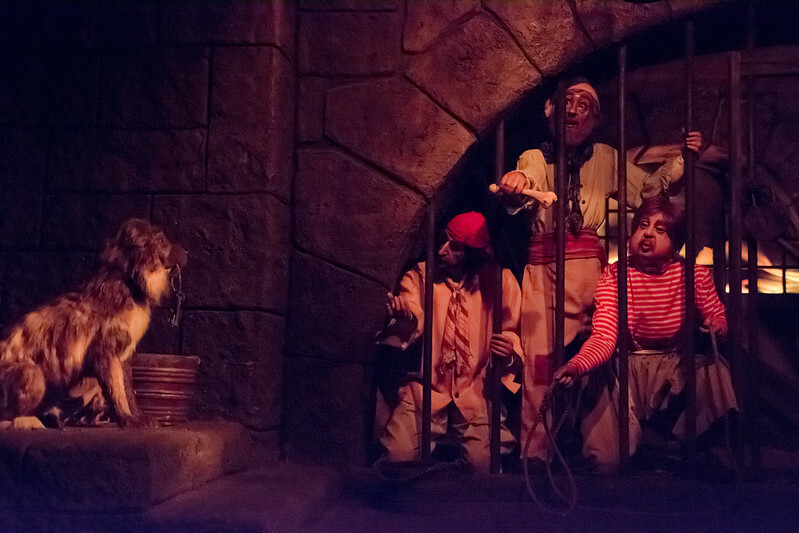 Finally, before leaving the park, we returned to Pirates of the Caribbean. Normally, I don't take any photos on this ride because the red lighting is so severe. However, we hit the typical boat jam near the jail scene, and I couldn't resist at least trying a photo. With some serious color correction in Lightroom, I was able to get rid of much of the red light. Still a bit of coloration issues, and not exactly tack sharp, but consider this a "Holy Grail" shot for me.